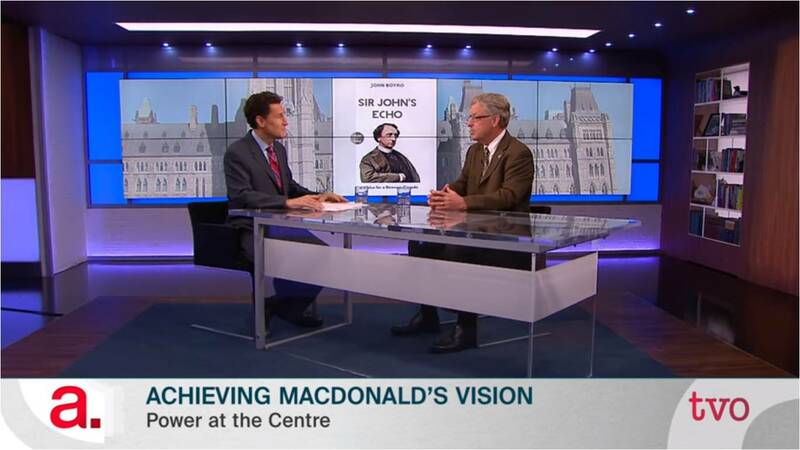 Historian John Boyko appeared on The Agenda with Steve Paikin on 30 May in order to promote his new book, Sir John’s Echo: The Voice for a Stronger Canada. Boyko presents this warmed over case for Macdonald’s centralized view of federalism and his initial support for a “legislative union” (i.e., a unitary state) of amalgamating the various British North American colonies into one new colony with one order of government. Boyko therefore focuses on the division of powers contained in sections 91 and 92 of the British North America Act, 1867, and emphasizes his own support of the principle in the POGG Clause in section 91 that non-enumerated, residual authorities fall within the competence of the Parliament of Canada and not the provincial legislatures. He subscribes to what I call The 1867 as Year Zero School of Canadian history: for him and his peers, everything started ex nihilo upon Confederation and the entering into force of the British North America Act, 1867. Nothing else matters — certainly not the political history of British North America prior to 1867. Boyko and other adherents to this school of thought therefore see Confederation as the be all and end all and either ignore outright or egregiously misinterpret what came before. Paikin: “Confederation was nothing more than a treaty between the provinces. That meant that the federal government was a child of the provinces and, like all children, should be quiet and obedient,” so say you quoting them [Mitch Hepburn, the Premier of Ontario and Maurice Duplessis, Premier of Quebec] back in the day. Do you see any legitimacy in that view? Paikin: There was an Ontario, there was a Quebec, there was a New Brunswick, there was a Nova Scotia. These were the four founding colonies of our country. Boyko: Yes, they were. And they came together in order that a new structure could be created, and they [the provinces] absolutely agreed with that new structure. Boyko then goes on to say that Oliver Mowat, the long-serving Liberal Premier of Ontario, established the precedent of premiers advocating for the authority of the provinces vis-a-vis Ottawa, which is correct. The remainder of the interview devolves into platitudes about centralized federalism, more “colony to nation” self-congratulatory Liberal Party pabulum, warmed over pro-Trudeau Statism, and whinging about Harper’s de-centralized federalism. Boyko’s assertion that the provinces didn’t exist before 1867 because they were colonies prior to Confederation is one of those statements which might sound clever at first instance, but it is, in fact, deeply flawed and at variance with historical fact. It is too clever by half and a feat of Jesuitical parsing. From 1867 to 1931, the Dominion of Canada was as much a self-governing Crown colony as the Province of Canada and colonies of New Brunswick and Nova Scotia were throughout the late 18th century to Confederation. The British North America Act re-organized these separate self-governing Crown colonies into one federal self-governing Crown colony, and several sections of the said Act explicitly provide for the continuity of the colonies of New Brunswick and Nova Scotia into the provinces of the same. These include section 7, which states that their borders remain intact, section 64, which provides for the continuity of executive authority, and section 88, which does the same for legislative authority and the corpus of existing laws. New Brunswick and Nova Scotia most certainly existed prior to Confederation. Furthermore, the Dominion of Canada is the continuator of the Province of Canada — which means that “Canada”, the polity that became the federal government, also existed before Confederation. The British North America Act also emphasizes the continuity between the Dominion of Canada and the Province of Canada, such as in section 9, which continues executive authority, and sections 25 and 127, which converted the Legislative Council of the Province of Canada into the Senate of Canada. Until the Statute of Westminster, 1931, the Dominion of Canada (and the Dominion of New Zealand, the Dominion of Newfoundland, the Irish Free State, the Commonwealth of Australia, and Union of South Africa) were all self-governing colonies of the Imperial Crown, subject to the jurisdiction of the Westminster Parliament and the Colonial Laws Validity Act. Boyko commits what I call the Canadian Nationalist Fallacy, a central tenet of the 1867 as Year Zero School: everything before 1867 is “colonial” and thereby relegated to the dustbin of history, while everything after 1867 is “Canadian.” In reality, this distinction does not hinge upon 1867, but on the accumulation of precedents from the late 19th century onward, which culminated in the Statute of Westminster, 1931. If anything, 1931, not 1867, is the year during which the “colonial” distinction turns. The Nationalist Fallacy thereby glosses over the constitutional development within the British Empire in the 19th and 20th centuries, which affected not only Canada, but all other British colonies, and the self-governing Dominions as well. The Canadian Nationalist Fallacy has arisen in order to support this whole “colony to nation” narrative, which first emerged after the First World War and firmly took root after the Second World War. Overall, this whole debate over the Compact Theory of Confederation and the merits of centralized versus de-centralized federalism, to which Steve Paikin alluded when he quoted or paraphrased Hepburn and Duplessis, stems from both inaccurate and irrelevant premises. Neither the provinces nor the Dominion created one another: they were all created by either the Imperial Crown (as with the Maritime colonies and British Columbia) or by the Westminster Parliament (as with the three iterations of Canadas from 1791 onwards). The question is not whether the Dominion of Canada or the provinces pre-date anything; constitutional questions should be adjudicated upon the relevant texts and historical precedents. The text of the British North America Act, 1867 demonstrates that the Dominion of Canada is the continuator of the Province of Canada. In turn, the Act of Union, 1841 makes clear that the Province of Canada is the continuator of the Canadas, Upper Canada and Lower Canada, which the Westminster Parliament established through the Constitutional Act, 1791. What is now the Dominion of Canada, the federal order of government, began in 1791. But both Nova Scotia and New Brunswick are older than Canada, and Representative Government also took root in the Maritimes earlier than in the Canadas. Nova Scotia’s elected legislative assembly dates from 1758; New Brunswick’s, from 1786. So, for whatever it’s worth, both New Brunswick and Nova Scotia are older than Canada. And, so what? What does this have to do with the division of powers in sections 91 and 92 of the British North America Act? Boyko dismisses all this history in one fell swoop through his assertion that the provinces of New Brunswick, Nova Scotia, Prince Edward Island, and British Columbia have nothing to do with the colonies of the same names, when they are, in fact, all successor polities of one another. He talks as if pre-1867 have no bearing on post-1867. This narrative is unworthy of celebrations of the 150th anniversary of Confederation. Historian Christopher Dummitt appeared on The Agenda with Steve Paikin on 10 May 2017 in order to promote his new book on Mackenzie King, and he casually stated something which flows from the 1867 as Year Zero School, whether he intended to do so or not. Dummitt is a serious historian, and my quibble with his comment on The Agenda does not detract from the scholarship that went into his new book. I’m simply using his segment as an example of how unspoken presumptions influence our interpretation of history. Probably, first of all, that he was prime minister for 21 years. So, sheer longevity. No one had ever done it before. No one in the British Commonwealth had ever done it before. And although historians should never predict the future, one safe prediction is that no one is ever going to do that again. Dummitt also argued that King’s greatest legacy is national unity and comity between English and French, and avoiding the civil strife that the Borden Unionist Government stirred up over Conscription in 1917, which is a reasonable conclusion. However, I would argue that Dummitt is wrong to accord Mackenzie King the distinction as the longest-serving prime minister in Canada — let alone anywhere “in the British Commonwealth” — and I would submit that this honour belongs to another Canadian: Sir John A. Macdonald. If you form part of the 1867 as Year Zero School, then you wouldn’t even contemplate considering Macdonald; his candidacy for this distinction would be a Rumsfeldian unknown unknown in that case. But if you consider that the Dominion of Canada is the continuator of the Provine of Canada, then you should count Macdonald’s tenure as co-premier of the Province of Canada plus his tenure as Prime Minister of the Dominion of Canada, as his contemporaries like Alpheus Todd did. Sir John A. Macdonald served as the first minister of the Crown for the better part of 28 years and four non-consecutive terms between 1856 and 1891, which surpasses William Lyon Mackenzie King’s three non-consecutive terms and tenure of roughly 21 years. Dummitt’s statement that King was the longest-serving prime minister anywhere in the British Commonwealth makes his omission of Macdonald even more damning, because even if you deny the place of the Province of Canada in Canadian history and the fact that it is the predecessor polity of the Dominion of Canada, you cannot deny its place in the history of the British Empire and Commonwealth more broadly. King would only be the longest-serving prime minister of Canada if 1867 is Year Zero. The best answer is that King is Canada’s longest-serving prime minister since Confederation. And King’s tenure surpasses Sir Robert Walpole, the longest-serving British prime minister, and Robert Menzies, the longest-serving Australian prime minister. (The longest-serving Australian state premier was Thomas Playford of South Australia, at 26 years). The longest-serving New Zealand prime minister, Richard Seddon, doesn’t even come close. But some provincial premiers have also broken King’s record of longevity. (Perhaps it would make for an interesting paper to explain why first ministers in Canada, at both the federal and provincial levels, have managed to cling onto power for longer than in our sister Realms across the Commonwealth). John Bracken served as Premier of Manitoba for over 20 years. Joey Smallwood racked up 23 years in office in Newfoundland and Labrador. Oliver Mowat is the longest-serving Premier of Ontario, having occupied the post for 24 years. Ernest Manning was Premier of Alberta for 25 years. Finally, George Murray remained in office as Premier of Nova Scotia for 27 years. But Sir John A. Macdonald surpasses them all. Sir John A. Macdonald is the longest-serving prime minister not only in Canadian history (at both the federal and provincial levels), but probably also in the history of the British Empire as a whole. 1841 or 1848? When Did Responsible Government Begin? James, this is well argued and persuasive. Years ago I heard a constitutional scholar (can’t recall who) argue that, in the BNA Act, Macdonald had ensured that the old provinces were first united into the Dominion of Canada and that only then were the new provinces created out of that new entity and that this approach was deliberately taken with a view to breaking the continuity for which you argue. I admit that I took this on faith but now, having looked with my own eyes at sections 3, 6 and 7, I can find no support for it. There is no suggestion of any temporal distinction between the creation of the One Dominion in s. 3 and the fact of its division into four provinces as set forth in s. 5. Moreover, there are other contra-indications, e.g., in s. 7 where the old NB and NS are clearly the same entities as the new NB and NS even though one could imagine alternative wordings that would have achieved Macdonald’s supposed purpose. What about the Dominion concept? Did the Fathers of Confederation or UK parliament discuss what they meant by “Dominion” or appear to regard themselves as having introduced a new type of status into the imperial order? Given that the alternative to “Dominion of Canada” was “Kingdom of Canada” (or of Mesopelagia or one of those other odd alternatives), it does seem that the new Canada was intended to be something substantially greater than a province even if it wasn’t significantly less colonial (which I agree it wasn’t). It’s hard to imagine a pre-Confederation “Kingdom of New Brunswick” and yet in 1867 such a designation was seriously entertained for Canada. I’m not sure if I really have a worthwhile question here but this whole subject is something that I’ve been curious about (while lacking the energy, knowledge and brainpower to address it effectively) so I thank you for having done so with such authority on your blog.